Representative Satoshi Komiyama. It was posted on YouTube for this blog. Please watch the video while following along with the story. I hope that you think about this carefully by ruminating this video in your mind. Plus Doolin's Story ( Animation video )↓bottom of post. on the outside of the net.Those dolphins did not leave until the remaining dolphins in the net was released. In this video's group of bottlenose dolphins in captivity where a rare albino was spotted. This time, 233 bottlenose dolphins are captured, Selection is carried out over a period of five days. 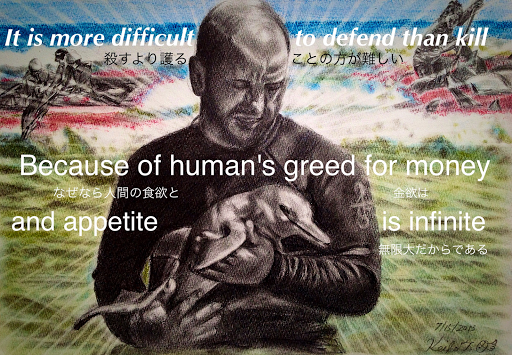 47 dolphins live capture and 46 dolphins have been killed on last day. This video is the killing of the remaining dolphins and the footage was taken just prior to release. Suddenly, One dolphin escaped out of the net. Dolphins swam to the side of the family that captivity. In the second half the video, the dolphin that is shifted out of the net is trying to breathe. This can be found in the upper right corner of the screen. Some of caught dolphins where physically hurt and some dolphin had no energy to swim. Some of them immediately faced upside down. 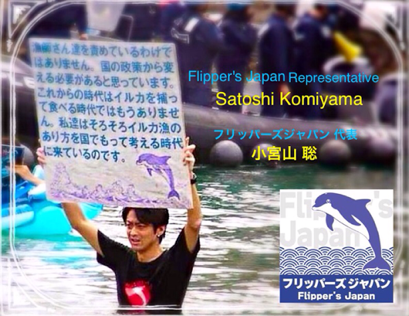 But, I saw many times that dolphin is upside down, the dolpins came beneth them to support their buoyancy. This picture is a dolphin that's upside down. Group of 233 bottlenose dolphins was spent in the cove for 5 days without food. and hearing family's scream inside the same cove. The surviving dolphins will receive a lot of stress. for their meat and forced into aquarium dolphin show. Thank you so much! Mr. Komiyama.